A soft, plasticised puff pastry fat for cold eaten pastry goods. The fat is based on a blend of selectively hydrogenated edible oils, which have been fully refined and deoderised. Conforms to both the Muslim and Jewish authority food standards. A soft, plasticised puff pastry fat for cold eaten pastry goods. 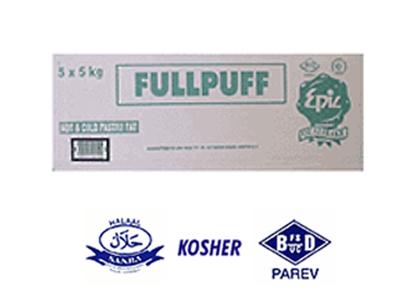 Fullpuff has been specially formulated for cold eaten pastry goods, such as croissants and Danish pastries. However, the fat is versatile enough to be used for hot pastries ie. a general purpose pastry fat. As Fullpuff is supplied in a sliced configuration, the slices of fat may tend to be difficult to separate when handled in unfavourable conditions eg. excess pressure or temperature.